In Gravedona, one is quickly haunted by ghosts of the past with a town that has retained its medieval urban plan and a creepy church dating from the 12th century. 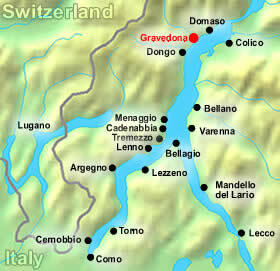 Gravedona may not be too far from Domaso, Lake Como’s windsurfing capital but the feel of the town is world’s apart. Even the residential houses tend to keep an ancient look about them, transporting tourists several hundred years back in time. For others, however, Gravedona may seem like a more convenient base to get their watersports needs met than Domaso. After all, it has one of the most beautiful lakeside promenades found anywhere on the lake, great bicycle paths, sandy beaches, public tennis courts and a variety of sailing centers. Here’s where we are (red dot)…Watch the Gravedona Italy Video! Gravedona hotels are located in the important historical town of Gravedona Italy – the ‘capital’ of northern Lake Como towns which still reclaims its medieval charm.